LOS ANGELES (AP) — Justin Turner and Mike Moustakas used some cross-league teamwork to book their trips to Miami. The third basemen each earned trips to next Tuesday’s All-Star Game by way of the final fan vote, each beating out four other finalists Thursday from their respective league. 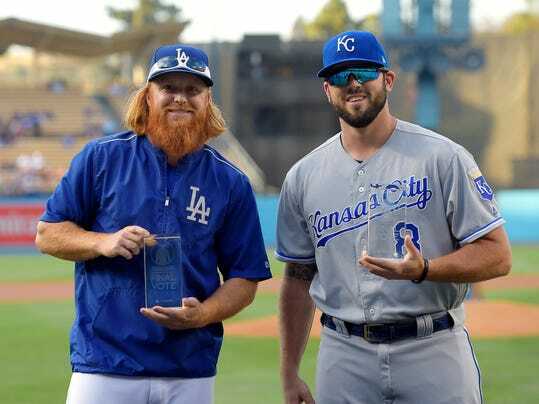 Turner, the red-headed third baseman for the Los Angeles Dodgers, led the final balloting with 20.8 million votes, and he encouraged his supporters on Twitter to also support Moustakas — a slugging third baseman with the Kansas City Royals — using the hashtag #VoteMoose. Moustakas returned the favor while leading the American League with 15.6 million votes.